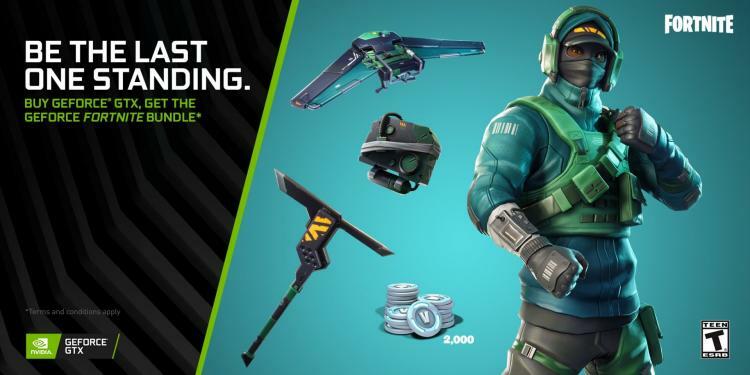 NVIDIA introduces the GeForce Fortnite Bundle offering in-game items in Fortnite with a purchase of any eligible GeForce GTX graphics card. The GeForce Fortnite Bundle is perfect for gamers that want to enjoy the ultimate Battle Royale experience with GeForce GTX graphics to be the last one standing. Purchase either a GeForce GTX 1060, GeForce GTX 1070, or GeForce GTX 1070 Ti to receive 2000 V-Bucks and the male Fortnite Counterattack Set. The Counterattack Set includes “Reflex” Outfit – Rare, “Pivot” Glider – Rare, “Angular Axe” Pickaxe – Uncommon, and “Response Unit” Back Bling. The GeForce Fortnite Bundle is available for a limited time only. One code per person only. Eligible NVIDIA GeForce GTX 1070 Ti, GTX 1070 and GTX 1060 graphics card models include NVIDIA's and select models from partner brands including EVGA, Palit, Gainward, GIGABYTE, MSI, ASUS, and others. Learn more about the GeForce Fornite Bundle here. Purchase the GeForce Fortnite Bundle and get a free copy of Monster Hunter: World as well! This unique offer ends on 7th of January, 2019. Learn more about the Monster Hunter: World Bundle here.